Giza 87 is the gift made by the cross between Giza 45 and Giza 77. 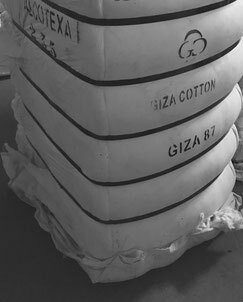 Introduced in 1997, it represents one of the successful attempts to give birth to a top quality Giza Cotton, similar to Giza 45 in term of fineness, to satisfy the estimators. As to the properties of Giza 87, fibers are extremely long (36 mm) and have a uniformity index of 89.8%, but what really makes this Cotton exceptional is the fineness of its fibers measured in micronaire, with an average of 3.0, and the degree of brightness equal to 76,6%, the best among the ELS Cotton varieties. The stretching resistance of Giza 87 fibers is also high with an average of 47.0 g/tex. In terms of resistance, cleanliness and regularity, the unique excellent features of Giza 87 are obvious, used to make extremely fine and strong yarns & fabrics that have an extraordinary soft and silky consistency. This kind of yarn is smaller in diameter yet stronger than yarns made by other cotton varieties. Finer yarn means that the more threads per square can be used to create strong fabric which has less weight, so it is precisely for this reason that Giza 87 let the marriage of softness and durability quality.